What is it about Abraham Lincoln and vampires? When Seth Grahame-Smith published his action/horror mash-up novel Abraham Lincoln: Vampire Hunter, scholars cringed. Few historians studying the 16th president were willing to go on the record to say what many truly thought, but suffice to say, it was not as supportive as the praise given for turning the life of Alexander Hamilton into a Broadway play. Nevertheless, a Lincoln/vampire connection does exist, and part of that story is now in the Smithsonian Institution. Signed copy of the 1899 edition of "Dracula," originally published in 1897. Courtesy of Smithsonian Libraries; photo by Morgan Aronson. In 1886 three men—New York businessman and art collector Thomas B. Clarke, Century Magazine editor Richard W. Gilder, and famed American artist Augustus Saint-Gaudens—contacted the secretary of the Smithsonian Institution, Spencer Baird, with a proposal. The three represented a consortium of subscribers who had recently purchased from Douglas Volk casts of the life mask and hands of Abraham Lincoln—items made by Volk’s father, Leonard, in 1860. If the Smithsonian promised to preserve the plaster mask and hands, and to guarantee that no future copies were ever made from the originals, the group would donate its Lincoln relics and a set of the bronze copies made by Saint-Gaudens. In April 1860 Chicago sculptor Leonard W. Volk learned that Abraham Lincoln was engaged in a protracted legal case in the city and requested that the former Illinois congressman come to his studio for a sitting. Lincoln—who often sought out opportunities to be photographed at key moments in his life—made time to be immortalized in a work by one of the city’s leading artists. 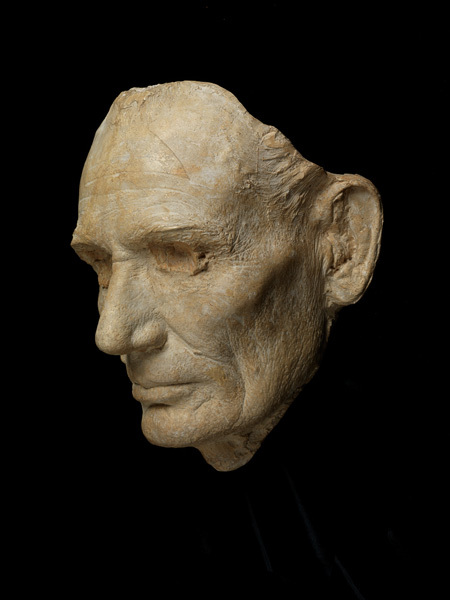 During their sessions, to aid in his creation of a bust, Volk produced this life cast of Lincoln. Captured in plaster is Lincoln on the verge of taking his place on the national stage, with every line and wrinkle on his face recorded. The bronze copy of the cast is currently on display in the “American Stories” exhibition. On May 18 Leonard W. Volk was in Springfield, Illinois, as news of Lincoln’s Republican presidential nomination became known. This time Volk asked to cast the nominee’s powerful hands. In Lincoln’s two-story house, the sculptor set up shop. Volk asked that Lincoln hold something in his right hand, and the two finally decided on a round piece of wood. Lincoln went out to his shed and sawed off a portion of a broomstick. 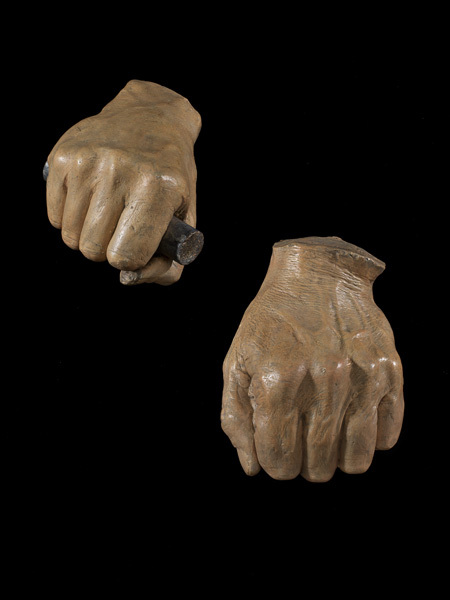 Volk kept the wood and later inserted it into his personal copy of the plaster-casted hands. The right hand is distinctly swollen, having shaken so many supporters’ hands the day before. The casts are currently on display in the “American Presidency” exhibition. On January 1888 the institution received the donation. It consisted of the original plaster life mask and hands, a bronze set produced by Saint-Gaudens, a signed affidavit from Leonard Volk, and an illuminated list of the 33 subscribers who, as a group, made the donation. The list includes well-known friends and admirers of Lincoln such as John Hay, the former president’s private secretary. 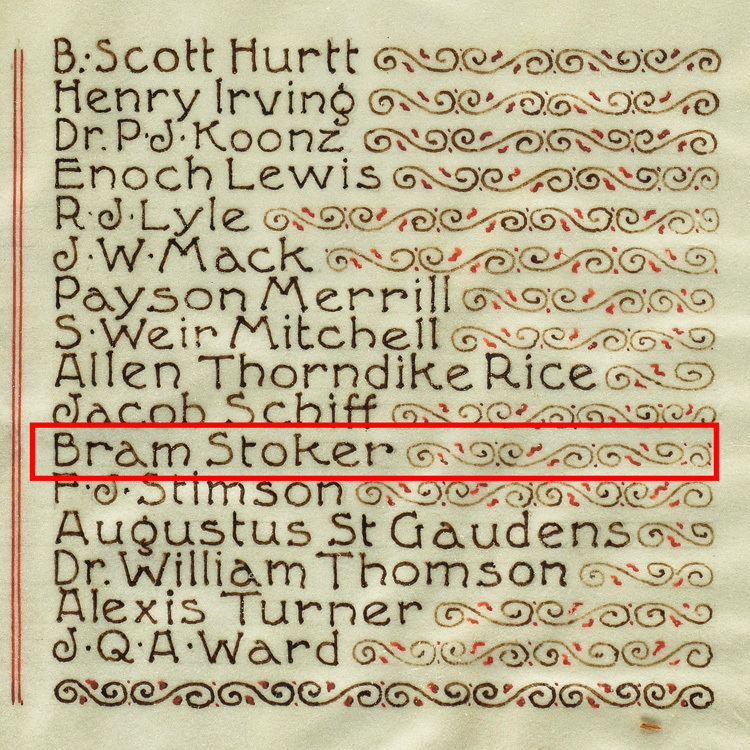 But one name curiously stands out: Bram Stoker, the Irish-born author of Dracula. This illuminated certificate on vellum accompanied the 33-subscribers' donation to the Smithsonian. A close-up of Stoker’s name on the illuminated certificate. 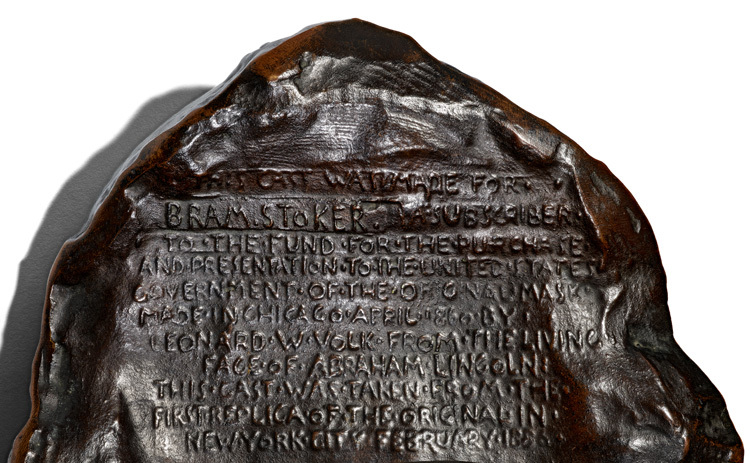 Why did Bram Stoker join the group, and how did he ever learn about the project? When the museum was given the opportunity to collect Stoker’s copy of the life mask, we decided to find answers to these questions. It turned out that American poet Walt Whitman held the answers. Stoker—like a number of young Irish students at Trinity College in Dublin—was drawn to this rebellious voice from across the ocean that explored the notion of manly love and comradeship. In 1872 Stoker began a correspondence with the poet. In what can only be considered fan letters, Stoker poured out his soul and declared himself a Walt-Whitmanite. In 1886 Stoker visited Saint-Gaudens’s New York studio, hoping to persuade the artist to make a bust of Whitman. 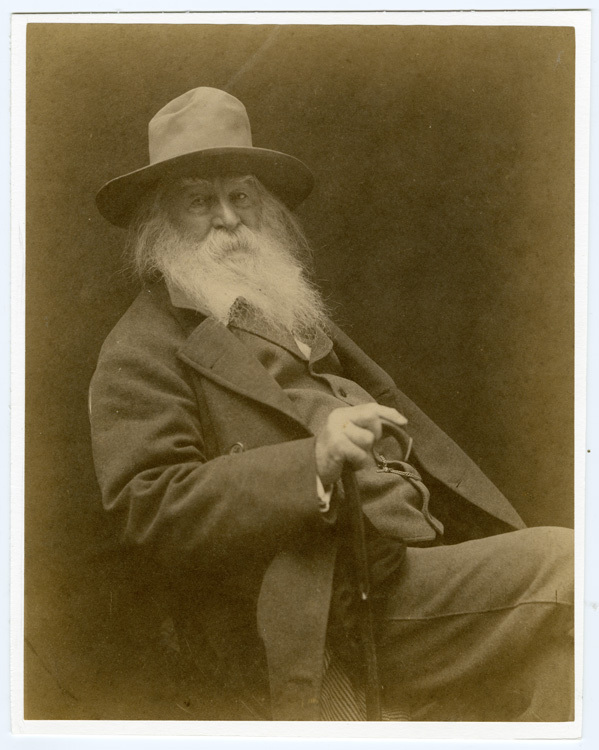 Saint-Gaudens expressed interest in creating a sculpture of the poet, but it never materialized due to Whitman’s declining health. By chance, sitting in the studio were the original casts of Lincoln’s life mask and hands. Seeing the relics, Stoker not only joined the list of subscribers, he convinced Henry Irving to participate as well. 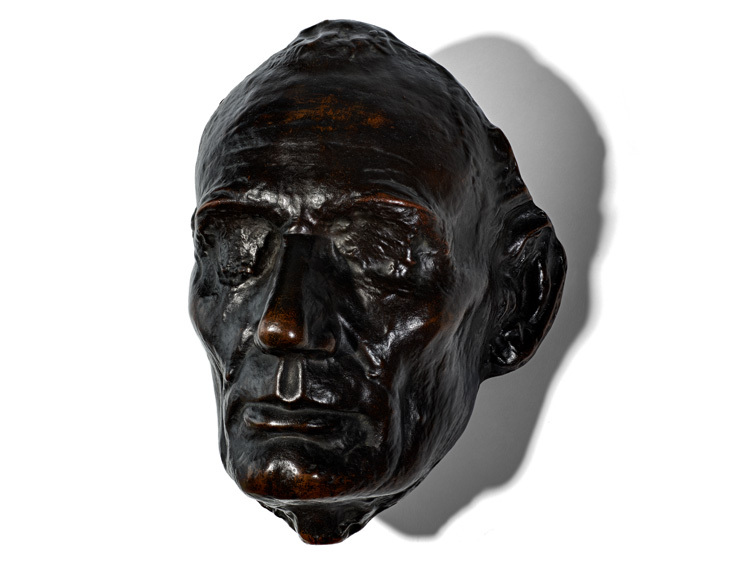 Bronze Abraham Lincoln life mask purchased by Bram Stoker. Affixed to the back of each life mask is an individualized plate with the name of the subscriber. Back in London, with the bronze mask of Lincoln resting on the podium, Stoker delivered a series of lectures on America in which he presented the stories that Whitman had shared with him. At his death in 1913, Stoker’s widow auctioned off many of his possessions. 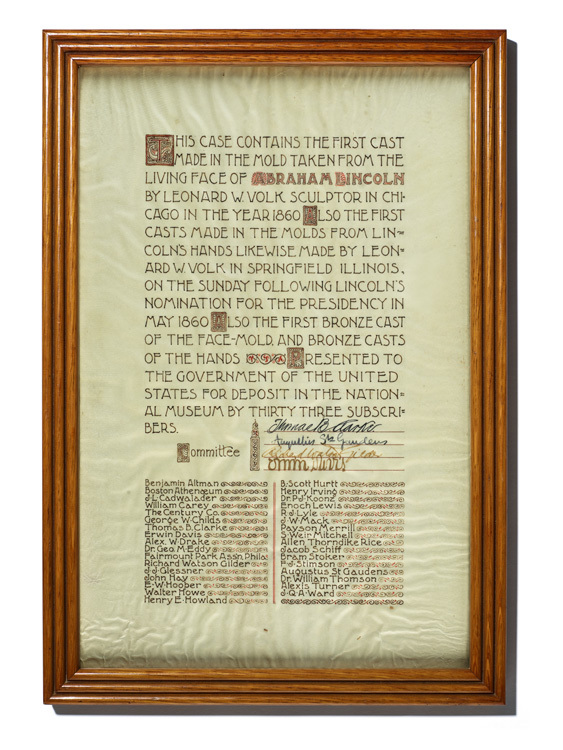 Prominently listed in the sales announcement were the author’s notes on Dracula, his Whitman collection, and the cast hands and mask of Lincoln. The life mask found its way into the personal collection of prominent American financier and philanthropist John D. Rockefeller Jr. (the whereabouts of the hands are unknown). He would pass the mask on to his son Nelson Rockefeller, who shared Lincoln’s presidential ambitions and would become governor of New York and vice president under Gerald Ford. Nelson gave the life mask to his daughter Mary Rockefeller, who presented it to her Springfield, Illinois-born husband, Thomas Bruce Morgan, whose career included being a writer; magazine editor for LOOK, Esquire, and The Village Voice; and press aide to presidential candidate Adlai Stevenson and New York City Mayor John Lindsay. 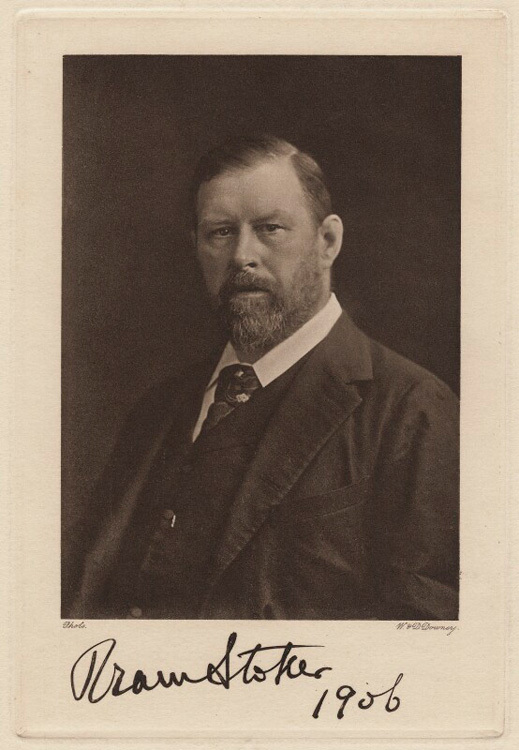 Following Morgan’s death, his children, Kate and Nick Morgan, hoped to find a more public home for Bram Stoker’s life mask and offered it to the National Museum of American History. This not only resulted in a wonderful new acquisition to the collection, but also led the museum to answer the riddle of Stoker’s involvement with the original donation in 1888. While the mystery of how and why Bram Stoker joined the group of subscribers has been solved, additional connections between Lincoln and vampires will have to wait for another day. Harry R. Rubenstein is a curator in the Division of Political History.